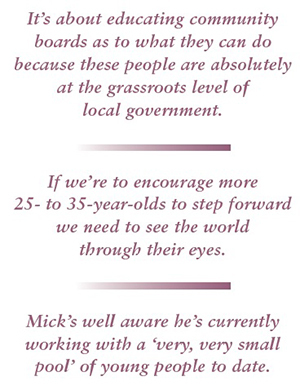 Mick Lester is on a mission to nurture the next generation of people willing to enter local government. He tells Ruth Le Pla how it’s going. Catching up with Mick Lester is a bit like trying to pin down a kangaroo. I’d lucked a meeting with him in Wellington a while back and since then he’s been bouncing round the country doing what he does best: supporting community board members in what, for many, are their first steps into local government. When later we talk on the phone he’d been in Kaitaia in the Far North two weeks before, then in Mataura in Southland. Two weeks afterwards he heads off to Christchurch, then he’s in Rotorua, then the Hutt and goodness knows where he’ll pop up next. He wears quite a few hats, to put it mildly. For the past 14 years he’s been a Hastings District Council councillor and on its rural community board. For the past four years, he’s also been the zone three representative for the nationwide Community Board Executive Committee and he’s now in his second term as its chair. The committee, which acts in an advisory capacity to LGNZ’s National Council, is charged with advocating in favour of community boards and promoting best practice amongst them. It’s these latter hats, of course, that keep him on the road so much. “It’s a lot of travelling and time,” he says in his understated way. He says he’s not sure exactly how many community board members there are in total throughout the country “but the legislation says you must have a minimum of four and a maximum of 12 members and we’ve got at the moment, I think, 106 community boards”. They stretch from Kaitaia in the north right down south to Bluff. And, given his travels, Mick must be a familiar face to most. “Really, I’m in a supporting role,” he says. “It’s about educating community boards as to what they can do because these people are absolutely at the grassroots level of local government. For the record, Mick’s own role as chair of the community boards executive is totally voluntary. He estimates he dedicates a day a week to the role on average and, apart from some travel expenses, doesn’t get recompensed. He sees serving on community boards as an apprenticeship for potential councillors. And he’s concerned about the various barriers placed in the way of people who may be willing to take such first steps into the sector. With the rate of pay for councillors nationwide not exactly sky-high, the same argument rings true higher up the tree, of course. It can be as simple as scheduling get-togethers for evenings rather than afternoons when most people would be at work. He’s “absolutely” seeing some – although not all – councils grasp that point and show a willingness to change. The desire to encourage and include younger people is also increasingly evident at the nationwide community board conferences which are held every alternate year. At the last big get-together, held in Wanaka in 2013, Mick included a healthy number of younger speakers. “They were marked 12 out of 10,” he says, “while old grey-headed people like me got much lower marks in the assessment at the end of the conference. Expect more of the same at the next conference which will be held in the Bay of Islands in May this year. Still, although he doesn’t have exact numbers, Mick’s well aware he’s currently working with a “very, very small pool” of young people to date. Members have since been asking if the two-yearly national community board conferences could happen every year. “But we’d need a lot more finance to do that,” he says. On the whole, he sees mayors, CEOs and officers as “incredibly supportive” of their community boards because they see the benefit of what the boards can do at the grassroots level in their communities.